Carnarvonshire: Caerhyn, Conway, Dolygarrog, Dwygyfylchi, Eglwys Rhos, Gyffin, Llanbedr y Cennin, Llandudno, Llangelynin, Llangwstenin, Llysfaen. Denbighshire and Carnarvonshire: Eirias, Llandrillo yn Rhos. The population falling within the union at the 1831 census had been 9,703 with parishes ranging in size from Dolygarrog (population 158) to Llansaintffraid (1,306). The average annual poor-rate expenditure for the period 1834-36 had been £4,209 or 8s.8d. per head of the population. In 1838, the Poor Law Commissioners authorised an expenditure of £3,535 on a new workhouse to accommodate up to 200 inmates. However, in Conway as in many other Welsh unions, there was little enthusiasm for the new workhouse system and it was another twenty years before its construction took place. The Conway Union workhouse was erected at a site on the north side of the Bangor Road about half a mile to the north-west of the town. Its location and layout are shown on the 1900 map below. The buildings consisted of a long front block, with two shorter parallel ranges to the rear. The first of these was two storeys high and linked to the front block via a short central range. The second range, possibly the original infirmary, was separate and only one storey high. Two small single-storey blocks lay to the north — the larger at the north-west perhaps being an isolation ward. Conway entrance from the south, 2000. Conway, view from east, 2000. Conway, view from west, 2000. Conway, rear range from the south, 2000. In 1901, a number of additions were made to the accommodation in 1901, including an extensions at the west end of the main block, and a new separate laundry block at the west of the site. Conway 1901 laundry from the north-east, 2000. 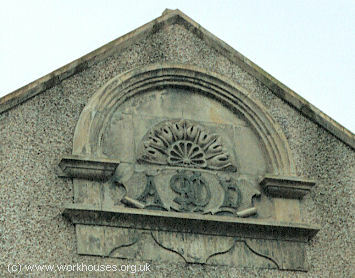 After 1930, the former workhouse became a Public Assistance Institution and then Conway Hospital for Aged Sick. The site continued in operation as a local hospital until around 2002. The buildings have now been demolished and the site redeveloped for residential use. 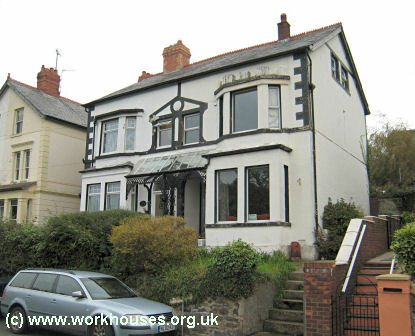 In 1909, the Conway Union established children's cottage homes in two houses 'Bryn Onen' and 'Bryn Conway' in an area known as Woodlands on Llanrwst Road just to the south of Conway. In 1926, a new children's home known as Blodwel was erected on Broad Street, Llandudno Junction. 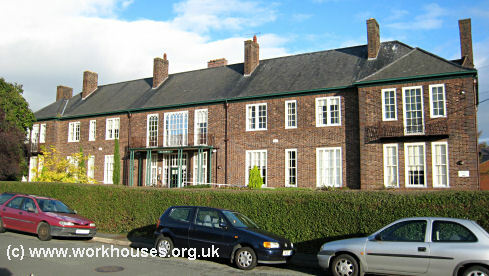 Conwy Archive Service, Old Board School, Lloyd Street, Llandudno LL30 2YG. Holdings include: Guardians' minute books (1879-1930); Letter books (1879-1913); etc. Draper, Christopher (2005) Paupers, Bastards and Lunatics - The Story of Conwy Workhouse .